Standard Time-To-Ship Is 2 Weeks or Request Our QuickShip** In 3-Business Days Option! The RCM Flo-Gage™ is a direct reading flow meter with a large, easy to read dial calibrated in engineering units (GPM, SCFM, l/min, etc.). The Flo-Gage™ measures flow based on a pressure differential created across a built-in calibrated nozzle. The meter is self-contained and complete. It does not require external power connections, separate orifices, or blocking, purging or equalizing valves. The Flo-Gage™ is suitable for measuring water, oil and most other low viscosity liquids which do not deposit out and which are compatible with the materials of construction. 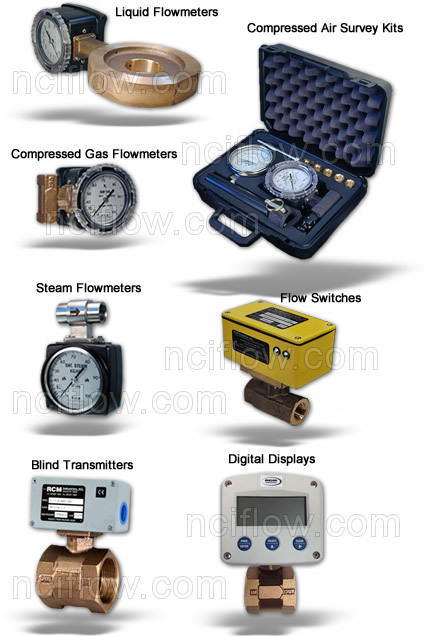 The Flo-Gage™ is also suitable for measuring compressed air, oxygen, carbon dioxide and many other nontoxic compressed gases. (Specify option I.) Saturated steam can also be mea­sured up to 120 psig. (Option K). The Flo-Gage™ can be fitted with a two-wire transmitter to provide a current output for remote indication, recording or totalization, or with reed switch contacts for signaling high or low flows. The Flo-Gage™ flowmeter has been developed for industrial ap­plications where durability and reliability are important consider­ations in the monitoring of flow. The Flo-Gage has accuracy for most industrial processes and is particularly suited for applications where compactness, low cost, minimal maintenance and resistance to accidental damage are important factors. Typical applications include: lube oil monitoring, blending pro­cesses, cooling water, reverse osmosis systems, and com­pressed air measurement. Flow Meters ship within 2 weeks as a standard. We also offer a QuickShip™ option resulting in shipments within 3 days from date of order. ** Carries a nominal charge for rush handling. See Complete Product Menu Shown Left Hand Side of Your Screen.